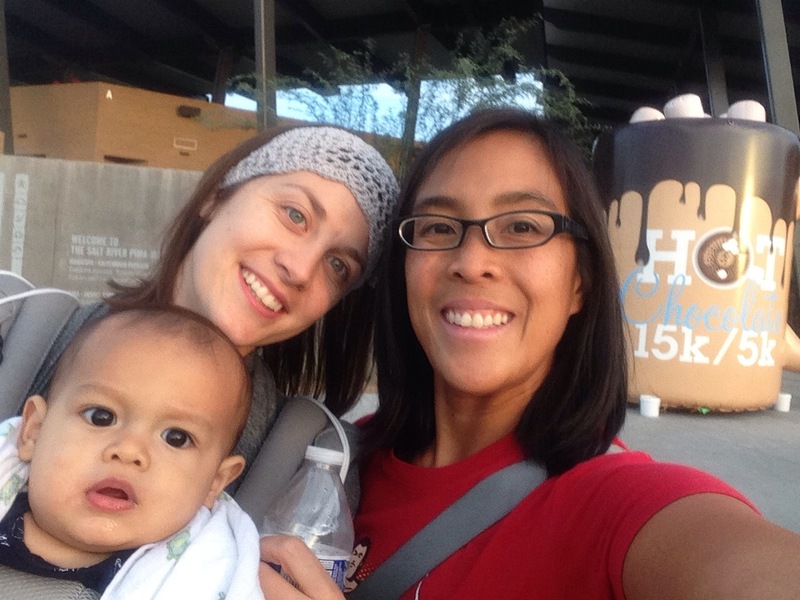 The Hot Chocolate 15k is one of my favorite races of the year! It has the best swag and this year’s 15k medal is the icing on top of this awesomely sweet race! I was an Ambassador for the race this year, so I’ve been waiting all year for this day. This year the race expo was in the concourse of Salt River Fields at Talking Stick. It was a big improvement over last year’s tight and crowded facility. This year the concourse was much more spacious! Ram Racing has a really efficient way to pick up packets this year, they print your name and assign your number on the spot. For a race this big, it’s a real time saver (both for pre race set up and for logistical reasons). I loved the ease of packet pickup. We went on Friday afternoon, so I did miss some of the other race tents I was looking forward to visiting (Tri for the Cure), but they had a lot of great vendors! The shopping was great. 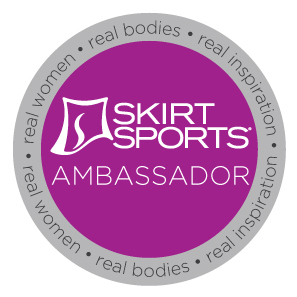 Skirt Sports and Sole Sports had a great selection and there were many options from the Hot Chocolate merchandise. This year’s goodie bag/swag jacket ran true to size, so I had to wait to exchange my L for a M. There were many of us looking to make this change, but thanks to my Sister in Law, I didn’t have to wait long to negotiate an exchange. My ambassador registration code (PHXHAT2) included extra swag (a pretty cool running cap) with the jacket. My nephew’s first #HC15k expo! My kids had so much fun eating the chocolate covered marshmallows and drinking the hot chocolate at the expo. I totally forgot to take pictures of all the chocolate goodness! 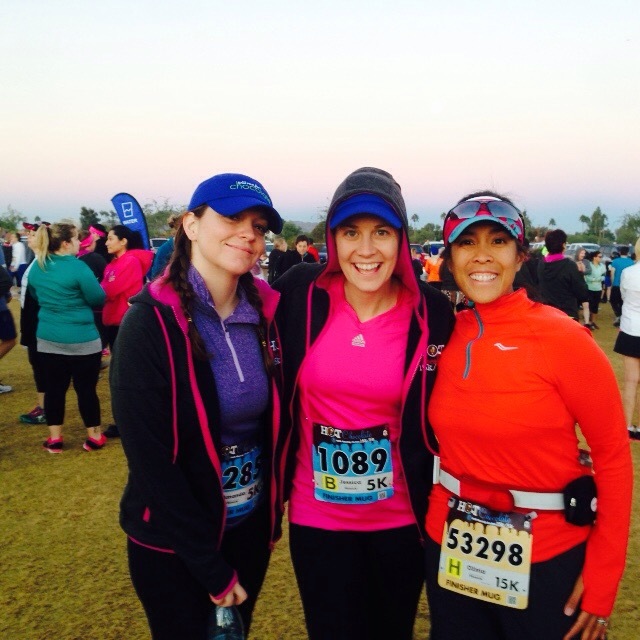 My SIL and friend were running the 5k, so I drove us up to the Talking Stick area. Traffic was moving a little slow by the time we got there (6:45am), but we were able to get a decent parking spot and walk up to the area. I had to get a new race bib since my original bib was missing a timing chip. The line for that moved pretty quickly so I didn’t have a problem. I met up with the gals and wished them luck on their 5k before we had to split up. Pre Race photo with the awesome running hat swag! 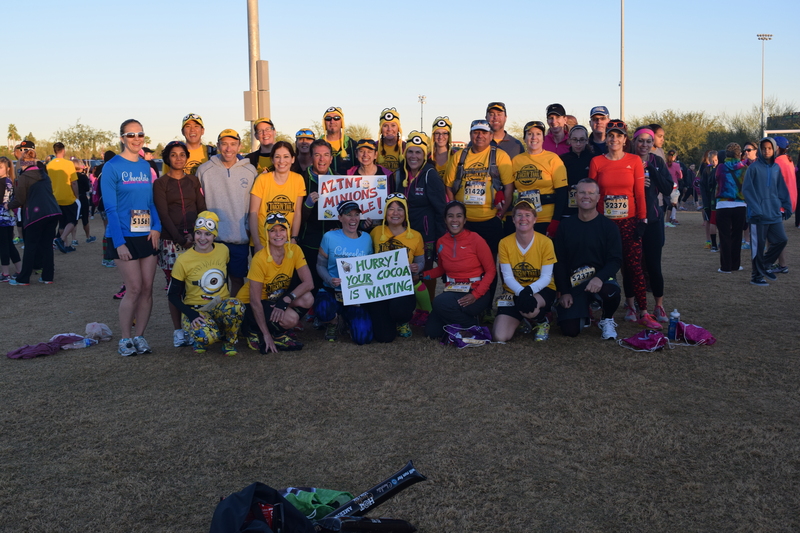 While waiting for the 15k to start, I met up with a few of my running groups for the pre-race pictures (AZTNT & Moms Run This Town). After the pictures, I dropped my warm clothes at bag drop and headed over to the starting corrals. As we were waiting to start, I got the text that my SIL finished her race! Yay for her!!! I still had to wait our race to begin. I ate a really early dinner the night before, and I only had a little bite to eat on the way to the race, so I was a little hungry as the race started (after 8:30 for my corral – H). After the first mile, I passed on the strawberry marshmallows and hit the honey stinger gummies. Mentally, I broke the race down into 5k segments. Once I passed the first 5k, I transitioned to running 4 min and walking 1 min. I continued the intervals (loosely) through mile 7. After mile 7, I tried to keep plugging along. It was great to see all the yellow AZTNT shirts along the race. I made sure to cheer for everyone as they were going by. Karen found me at mile 8 and that gave me a big boost to the finish! There were a couple of guys in orange and blue that had a great pace. I was going to draft them to the finish, but as soon as I told them of my plans they bolted! I was able to finish the race strong with almost 5 min (!) improvement on my last year’s time! After being sick for most of the week, I didn’t think that I was going to be able to pull it off, but I did! Yes, I’m still grinning from ear to ear! Finish line video: http://results.chronotrack.com/athlete/index/e/12235026 You can see me jump just after I cross the finish line! After the run, I picked up my chocolate goodness and caught up with a few AZTNT people and the #RunEatTweetAZ group for a couple of pictures. It’s great to meet everyone, even if I’m so awkward in person. I’m so glad Jeremy was taking pictures of everyone! 1. The Swag – Jacket + extra goodies can’t be beat. 2. The Volunteers – There was so much great energy along the course! It was transferable and picked me up along the way. 3. The Medal – This year’s finishers medal is really awesome. I love that they listened and added it from last year. 1. Bag Drop – The bag drop is not close to the finish. I had to leave the party a little early to make sure to get my things before I forgot. 2. Timing – The 5k starts an hour before the 15k. And the 15k corrals are in waves of 15 min. I understand the need to space out the participants, but it makes for a long wait. 3. Sweets on the Course – If you’re racing this race, you’ll probably want to skip the marshmallows and chocolate along the course. Especially, if you didn’t train with these in mind. Overall, it’s still one of my favorite races and I’m already looking forward to next year. Disclaimer: I was a 2014 Hot Chocolate ambassador. I paid for my 2014 race entry and I received bonus swag for promoting the Hot Chocolate 5/15k events. 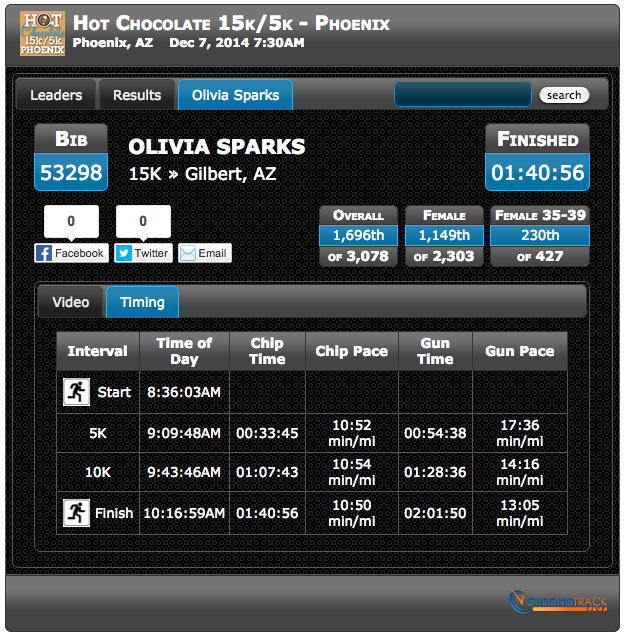 Posted in RacesTagged 15k, aztnt, hot chocolate, mrtt, race, recap, runeattweetazBookmark the permalink. This week: Dec 8 Fiesta prep!